Blitz Form is a Form in Kingdom Hearts III. It is a form that emphasizes speed and mobility. Triggered by Crystal Snow, Nano Gear, and Grand Chef. 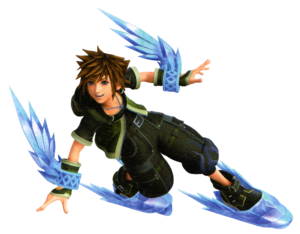 Blitz Form turns Sora's coat, gloves, and shoes green, with a flame pattern on his pants. Air Slide While airborne, tilt the stick and press to air dash in that direction and evade attacks. Stack the ability to increase the effect. Glide Hold while in midair to glide at high speed. Superslide While in flowmotion, tilt the stick and press to air dash a long distance. Stack the ability to increase the effect. Combo Master Continue combos even if your swings miss the enemy. HP Walker Recover HP as you walk or run. Stack the ability to increase the effect. MP Walker Recover MP as you walk or run. MP charging remains unchanged. Stack the ability to increase the effect.